Local experts weigh in on designing an outdoor space that incorporates all of the comforts of home—green thumb optional. Ruben Flores, Craig de Pfyffer and Gene Sottosanto cultivate and make possible some of the most unique and beautiful residential outdoor spaces in Laguna. With experience accenting anything from a cottage retreat to a complicated cliff-side estate, each of these experts takes pride in designing landscapes that complement that natural environment while remaining eco-friendly. 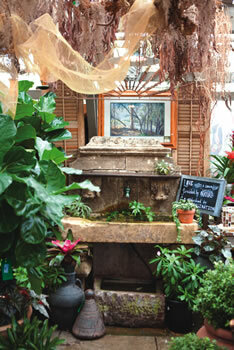 Here, the three share their best-kept secrets for creating the garden of your dreams. 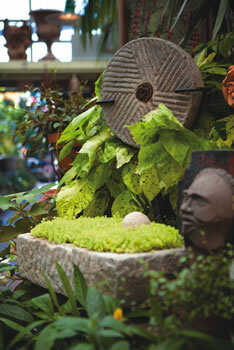 With the right plants and a little furniture, the outdoors can feel as intimate as the inside of your home. Ruben, a Laguna Nursery landscape designer and horticulturist, suggests trying to personalize your garden with the use of furniture such as a simple wood platform deck, or even art that you’d normally hang indoors. This will help make the space feel more like an extension of you. Water features also create habitats for birds, dragonflies and other wildlife, says Craig, a landscape architect and Environmental Designs Landscape founder. “Install a water reservoir with a recirculating pump and add a low-voltage underwater light for interest at night,” he says. Another way to customize the space is to think of how you’ll be using it. Is your goal to create privacy? A space to have cocktail hour or dinner with friends? Once goals are set, remember to “have fun—the garden should be a place of inspiration and joy. Don’t create a maintenance monster that you dread,” Ruben adds. Gene, known as Green Gene, has been a landscaper and gardener in Laguna Beach since the mid-1970s and agrees that low maintenance is the way to go. “I don’t like to do high-maintenance, low-production gardens—you know, everything mowed and sheared in a straight line. It should be a little more relaxed and not as logical,” he says. Being eco-conscious doesn’t have to mean giving up style. Choose plants that tolerate less water, attract wildlife and, if possible, are California natives. Craig also suggests installing a smart controller for the automatic sprinkler system. “Smart controllers adjust the amount of water applied to the landscape based on weather conditions to conserve water,” he explains. Craig adds that native plants or a meadow of drought-tolerant grasses reduce the water, fertilizer, pesticides and maintenance requirements for a healthier environment. Ruben suggests Southern California native Ceanothus (the California blue lilac) and citrus trees. “Citrus is fragrant, gives fruit and is a beautiful tree,” he says. Craig says a great flowering perennial is the Penstemon heterophyllus (the Margarita BOP), which attracts hummingbirds to the garden. Whether you opt for an eco-friendly environment or a sacred sanctuary where you can fall into your own thoughts, gardens are personal spaces meant to be reflective of your personality. Earth friendly production materials and methods.